Steep slopes are a daunting place to garden, but it is important to install some form of landscaping to prevent the forces of erosion from having their way. 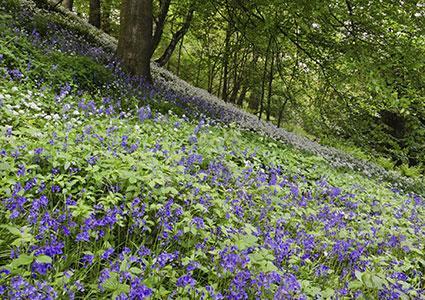 Rather than letting an unruly hillside become an abominable eyesore, consider the options for taming it into a beautiful, functional part of the landscape. Rock gardens are a loosely defined concept that belong on sloped terrain by definition. Rocks are a big part of the equation in a rock garden and are used for decorative purposes, as well as for holding the soil in place. There are no hard and fast rules about what type of stone is supposed to go in a rock garden. The tan-brown ones pictured above look like they belong in an arid climate, which makes them a good fit. It's also nice to find rocks that have lichen growing on them, commonly referred to as 'field stone' in the landscape trade. One thing slopes have to offer is good drainage, something that many plants can't do without. So they are the perfect place for finicky species like dwarf pine trees, rock roses and salvias that can't stand to have their feet wet. In general, small succulents, cacti or alpine species that would naturally grow on dry, rocky hillsides are a good choice to match the environment created in a rock garden. 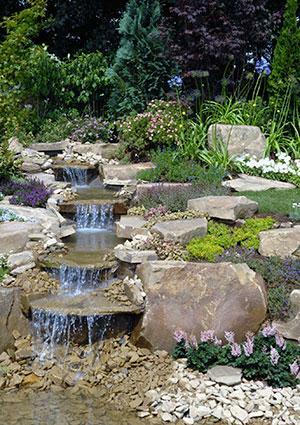 Rock gardens are often comprised of diminutive plants, making them a good choice for small slopes in a backyard setting where the tiny plants can be viewed up close, rather than as extensive landscaping. However, the concept can easily be extended to any use of decorative stone in the landscape, but be sure to use rocks and plants that match the scale of the site, as well as each other. 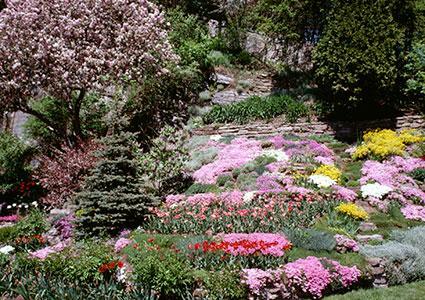 In lieu of formal landscaping, spreading groundcovers are one way to beautify a hillside and stabilize the soil. These can be cascading grasses, mixtures of wildflowers or other low-growing, low maintenance plantings. From common species like ivy and vinca to creeping roses and flowering salvias, groundcovers come with a tremendous array foliage characteristics and flower colors. The key is to understand the conditions of the site (sun/shade, soil type, climate, etc.) and choose species to match. If you're not going to install irrigation, choose something drought tolerant and plant it in the fall so it can get started while the weather is cool. Over a large area, it's much more economical to establish the plants by seed. One cost-effective way to do this is with erosion mats, which are biodegradable blankets that hold the soil in place until the plants get established. The first step is to clear the existing vegetation, then spread the seed and stake the fabric on top of it. Water regularly until a lush mat of vegetation is established. To avoid having a monotonous sea of vegetation, consider planting swaths of different plants. If there are existing trees, highlight them as focal points by centering drifts of one particular species on each tree. If the slope is a complete blank slate, adding a vertical element, whether a tree or just a bird feeder on a post, will help to add visual interest. Creating a full-fledged landscape on a slope is a lot of work, but can be a dramatic addition to the overall landscape if planned carefully. Imagine a forest-like planting with beautiful, broadly spreading trees, flowering shrubs, bulbs and cascading groundcovers, all neatly arranged in a crescendo of color and texture as the eye moves up the slope. The size of the shrubs is just right in proportion the trees and everything seems to have its place. Plants are selected to bloom sequentially throughout the year - a hillside haven for butterflies, birds and other precious wildlife. The goal is to create a forest glade or grotto-like planting that is somewhat open in the middle, so you can see all the different layers at once. Start with placing the trees. They should be in the rear two-thirds of the slope with the tallest species going in back - don't be afraid to mix deciduous and evergreen varieties. Shrubbery should be placed randomly in groups of three, five or seven plants, but generally in order from smallest to tallest as you go from front to back. Fill in the remaining spaces with groundcovers, bulbs and perennials, using the smallest, daintiest species up close. Mulching heavily around the plants is important to hold the soil in place and keep down weed growth. 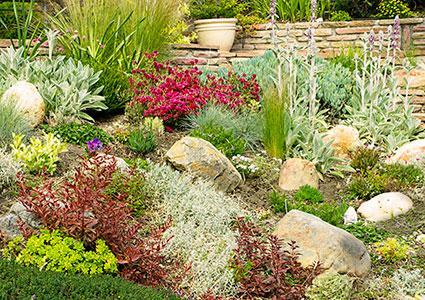 It is important to use drought-tolerant plants unless permanent irrigation will be supplied - slopes dry out fast. Otherwise, the primary maintenance is to grow the plantings a couple times a year to prune back excessive growth and keep each species in its own distinct niche where it doesn't infringe on the space of its neighbors. Terracing often requires the expertise and equipment of a reputable landscape contractor, but it is the ultimate in hillside landscaping. Terracing involves using earth moving equipment (or a lot of hard labor) to cut a series of flat benches into the slope and the installation of professionally-engineered retaining walls to support the soil where each cut is made. When complete, any type of landscaping can be installed. Fruit trees, grape vines, a rose garden - the options are only limited by your imagination. 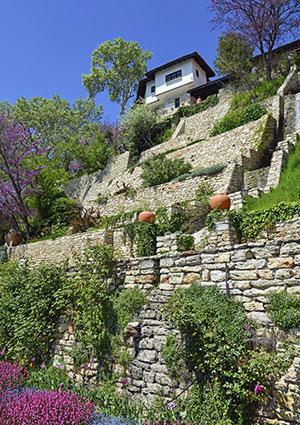 Retaining walls and terraces go hand-in-hand. Natural stone, interlocking concrete blocks and railroad ties are a few of the material options out there - think about the materials and general aesthetic of your home and surrounding landscape features and choose the one that fits with the overall design. If you're not up for terracing the entire slope, you can still building a low retaining wall at the bottom, which tidies it up with a crisp clean line and ensures that the soil above will stay put. If installed at bench height, the retaining walls can also be used as an informal seating area - building them taller than two feet generally requires the expertise of a contractor. Terraces have been used for millennia as a way to not only stabilize soil on hillsides, but also to create a series of flat areas that are easy to walk on. However, this implies the integration of steps in the design of the terraced garden. For a dramatic and formal look, center the steps in the middle of the terraces and make them broad and wide, tapering to a grand entrance at the bottom. If you don't want the steps to interfere with the arrangement of the plantings on the terraces, locate them at one end, building them only as wide as needed. Perhaps the only thing that could be more exciting than beautiful stone terraces on a slope, is a beautiful, cascading water feature. Water features need maintenance a minimum of once per week to clean out debris. There is an ongoing cost in running the pump to power it. Many things that can go wrong and you'll probably need the help of a professional to fix them. Do you want the effect of a waterfall or a burbling stream? Will the water empty into a sizable basin at the bottom or will it be a pondless water feature? Would you like a naturalized look with mossy boulders and lots of plants or an architectural showpiece with formal stonework and a symmetrical design? Whatever direction you choose to go in, know that each has it respective set of materials and necessary equipment; ask a landscape designer who specializes in water features to show you the options. Also, keep in mind that different designs will create a different soundscape - a tall, plunging waterfall may be beautiful to look at, but living with the sound outside your door may not be the ambiance you were looking for. A water feature is not complete without plants to go with it. Aquatic plants include floating species, like water lilies and water hyacinth, and emergent species that stick out above the waterline such as papyrus and bulrush. There are also many interesting wetland species that can occupy the margins, many of which have bold flower displays (lobelia) or stunning foliage (Gunnera). Be sure to include an array of vegetation outside the water feature as well, accompanying it with ferns, trees with weeping branches, and lush groundcovers. The key to landscaping on a slope is to keep the soil in place; otherwise, the plantings will slowly wither and fade. Often, the steep slopes found around the home are the result of cuts that were made into the earth when the house was built, meaning there is unlikely to be good quality topsoil. With all of these options, the first step is to assess the existing soil conditions and improve them if necessary. If a little digging reveals nothing but hard, light-colored subsoil - rather than soft, dark-colored topsoil - plan on amending the slope with a layer of good quality soil brought in from off-site.